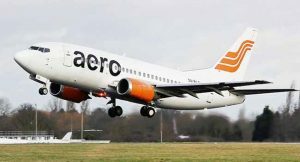 The management of Aero Contractors, has been explaining the incident that led to the smoke in the flight from Port Harcourt to Lagos on Tuesday evening. The airline’s Managing Director, Captain Ado Sanusi, told Channels Television on Wednesday, that the smoke originated in the cargo section of the aircraft and got into the cabin through the air-conditioning system. He said the pilot, however conducted the flight and landed safely, adding that the plane is due for a test flight today. Meanwhile, several reactions have continued to trail the news of the incident. The terrified passengers were seen praying frantically in some videos which were recorded by some passengers and have gone viral on social media. “Every one on this Aero Contractor flight could have died today but for God. I’m grateful. Nigerian airports need new directors/ flights. The female passenger also stated that no apology or explanation was given to the passengers. She however noted that officials of the Fire Service Emergency Unit, were already waiting on the runway as the plane eventually landed safely in Lagos.